"What moves through us is a silence, a quiet sadness, a longing for one more day, one more word, one more touch, we may not understand why you left this earth so soon, or why you left before we were ready to say good-bye, but little by little, we begin to remember not just that you died, but that you lived. And that your life gave us memories too beautiful to forget"
kdg2 kita tak expect dgn apa yang berlaku akan dtg. the excitement of coming home on friday is actually something saddest happen in my life. farewell with the closest friends in GEMS and the biggest lost of my cousin . speechless. i just dun know what else to say and express the feeling. as the tears keeps falling till now. everytime the past memories comes by, i just look at the sky and wish that he could hear and see us through and know that how important he is to us. he's everything to us. from his father side and also his mother side. Salam.eventhough mase kecik the moment you still stay in muar, both of us keep fighthing and all the moments of your naughtiness still in my mind. how naughty are you are actually make us smiling all day. i always start the fight wish that i could make you cry first but then im the one who cry first and you are the one who celebrate the victory of making me cry. gosh. all moments that we having together when youre still kids and till at the age of 18, will remembered for eternity and forever. never fade. p/s: im just soooo damn sad! gosh!!! 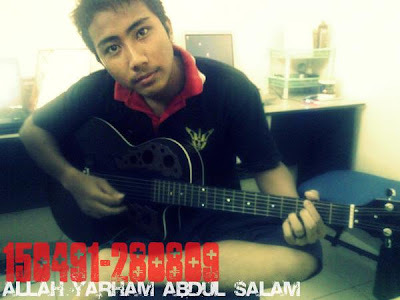 i miss you Salam!!! badly! Doakan kesejahteraan dia di sana..